Please join us for Professor Wolfgang Ernst’s lecture, on the occasion of the publication of his book Chronopoetics by the Media Philosophy series. Chronopoetics investigates the ways technological media are time objects and time subjects. After having got used to non-historical ways of rethinking media time, more constructively it takes an active step to develop a new language for the analysis and implementation of such tempor(e)alities in both individual and cultural time consciousness. While conventional historiography of technology writes “about” media time (that is, in the instransitive mode), a transitive approach to express multiple media tempor(e)alities needs to be developed. Next to non-linear verbal forms of argumentation, that results in graphical diagrams and even sonic rhythmograms – and in different temporal moods of listening to audio recordings with media-epistemological ears. 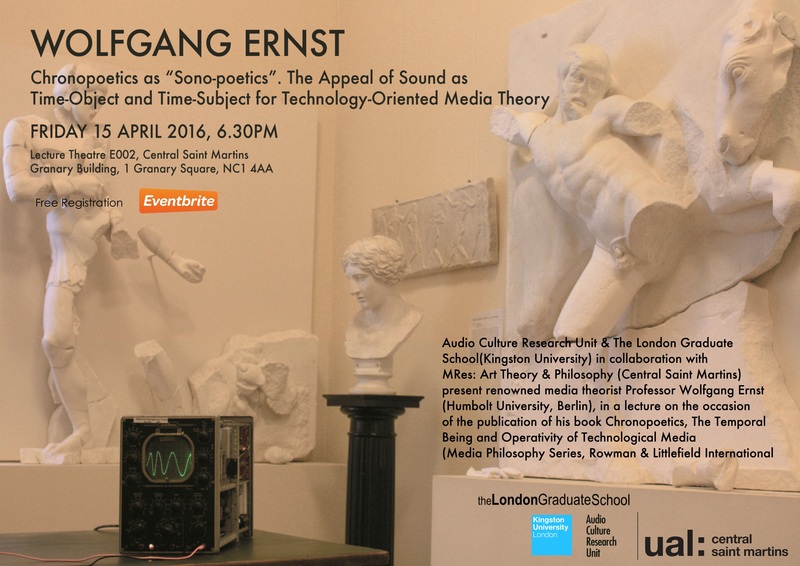 Wolfgang Ernst is professor for Media Theories at the Institute of Musicology and Media Studies, Humboldt-University, Berlin. His publications in English: Digital Memory and the Archive (2013); Chronopoetics (2016); Sonic Time Machines (forthcoming 2016). Research fields: Time-based and time-critical media processes; implicit “sonicity” in techno-mathematical media; technologies of cultural tradition; experimenting the writing of media time in non-historiographic ways; media archaeology as research method.